The start of Spring also means the start of out door running for many of us here in Longmont, Colorado. I am already seeing running injuries this soon in the year so I would like to talk about one that is really affecting some of my new patients. It is Achilles Tendonitis. 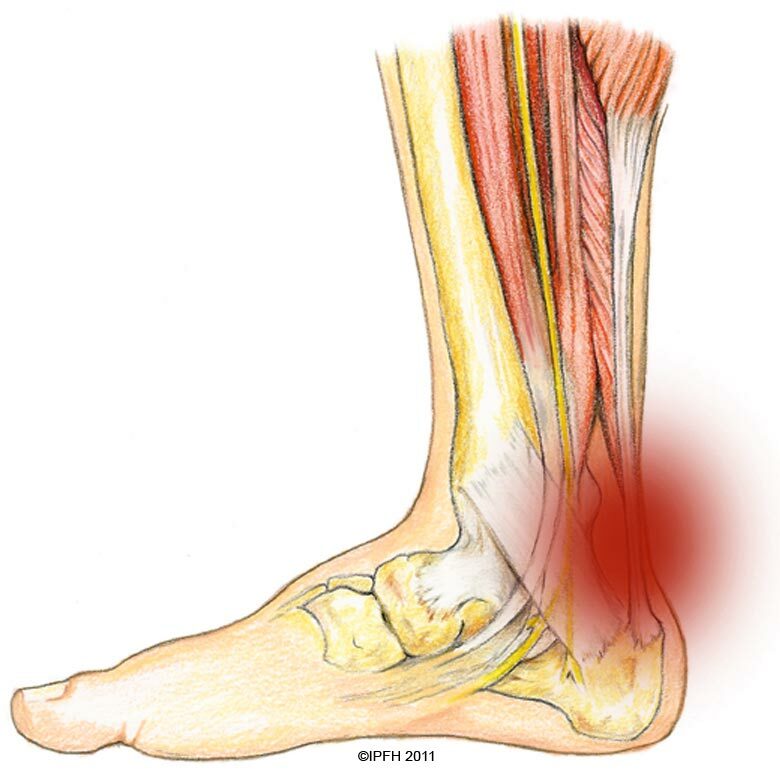 Pictured in the image below, Achilles tendonitis is inflammation and swelling of the Achilles tendon. The Achilles tendon is where the muscles the muscles of the calf insert into the back of the heel. In face the Achilles tendon is the largest tendon in the body. Typically what happens is an increase in running, starting running after a long dormant period, old shoes, or running on new terrain, causes tightness of the calf muscles. As the calf gets tighter it pulls on the Achilles tendon which causes more inflammation and irritation. Soon this repetitive strain causes pain, swelling, and a difficulty walking and/or running. If let untreated it will worsen. Some runners start to develop a visible bump on the back of their heel from the inflammation and scar tissue. As the condition worsens the patient is left unable to run. It can also cause issues in the foot and ankle which can become disabling. There are a few things you can do to try to prevent this from happening. Most important is to stretch your calf muscles. The more flexible you are the less likely you are to become injured. Also it is important to drink lots of water. The more hydrated you are the less likely you are to become injured as well. Change your running shoes every 250 to 500 miles. If you are running in the same shoes you had in high school it is time to buy new ones. As running shoes wear out they become less supportive and can cause the arches to drop which can cause pronation. This in turn causes increased tension on the Achilles tendon, which leads to Achilles tendonitis. If you are all ready experiencing the pain of Achilles tendonitis, give us a call at Cavallo Chiropractic. There are many things we can do to help this condition and get you back running. We utilize cold laser in our office and this will help decrease the pain, decreases the inflammation and speed the recovery process. So if you are suffering give us a call at 303-678-8555 or visits us at our website.